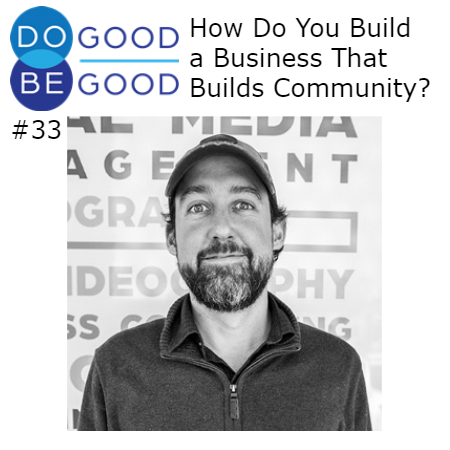 What does it look like to build a small business that is grounded in the community and which feels like a family? Rand Jenkins, Founder of Mountain Mojo Marketing Group, has been trying to figure that out. Rand and podcast host Sharon share their early bad experiences with jobs with poor ethics and their personal commitment to building businesses that are benevolent. 00:00 Rand Jenkins: But there was no way that I could have possibly prepared for when it is. You start to sign the front of checks and you have that role, that responsibility for others, and their families, and that stress is so overwhelming. 00:15 S? : This is Do Good, Be Good, the show about helpful people and the challenges they face in trying to do good. Your host is Sharon Tewksbury-Bloom. A career do-gooder, who also loves craft beer and a good hard tackle in rugby. Sharon speaks to everyday people about why they do good and what it means to be good. 00:34 Sharon Tewksbury-Bloom: Hi, this is your host Sharon Tewksbury-Bloom, and I’m back with the last episode in season three, Meaningful Work. On today’s episode, I’ve got a great guest, Rand Jenkins. Rand is the founder of Mountain Mojo marketing group, a local marketing firm here in Flagstaff, Arizona. Mountain Mojo were the ones who designed my logo. I think it’s pretty awesome, so thanks. I wanted to bring Rand into the studio, and talk to him because he looks at his business as not just a business, but really a vehicle to build community, both with his employees, as well as with how he partners with community non-profits and is always thinking about new and better ways to serve the communities in which he is based. Rand and I get into that during this episode. 01:29 RJ: I was a busboy at Seafood Restaurant in Winter Park, Florida. So we had some older servers that would not be honest as far as the tipping goes, and I just figured you do a percentage and you wouldn’t pocket any money. But we had some older servers that were… I don’t know, they like to go into the dog races, and doing other things with their money that is questionable. [chuckle] And so, yeah, when I first found out that they weren’t paying me what they were supposed to be paying me, it was a little awkward. It was shocking, and then disappointing, and then I had to have a conversation, a grown-up conversation with a grown-up, it was a lot. 02:14 ST: I feel like that reflects my own first job experience in terms of shocking, disappointing, grown-up conversations. 02:22 RJ: Oh no. What did you do? 02:40 ST: Just came right out. And it was like, “Do you like to steal? Oh, ’cause I do,” and then she just blatantly stole right in front of me, very first day. 03:05 RJ: Yeah, which is crazy. Especially one of your peers. 03:08 ST: I ended up having to write, I didn’t have to, I guess, but I wrote a letter to the manager. She got fired. 03:16 ST: Yeah, lots of just stuff that you were like, this is not what I was expecting my first experience in the work world would be, it seems like it gets lotted as a great experience for young people to learn discipline or something. And I was like we just learned all the bad stuff. 03:31 RJ: Yeah. Right off the bat. 03:32 ST: Yeah, I was doing fine until I got it into the work world. 03:36 RJ: That is funny. Not a lot of people describe the ethical nature of the lessons that you’re going to learn from grown-ups when you get that job. 03:44 ST: Yeah, and then my next job, the manager was going out of business, it was a small family-run business and so she had me lying to creditors over the phone. 03:56 RJ: Dodging. Wow. You did learn a lot. 03:58 ST: Yeah, yeah, all my ethical questions got brought up within my first few years of work experience. 04:04 RJ: Which is good. It’s good for the future, especially if you’re gonna own your own business. 04:11 ST: Yeah, yeah. So did you stay in food service or where did you go next with your work? 04:17 RJ: I did. Then I got a job, dishwashing with my buddy and so that was a little bit more money and then I moved my way up to salad bar, which was a little bit more money and then I had all sorts of jobs. I worked for a moving company, and then I started to move around the country, and just pick up jobs here and there. 04:33 ST: So when was the first time you really had work that you felt like was meaningful? 04:37 RJ: Probably when I started my own business, my first own business then I knew that I could have a little bit more of an impact on what I did. I had a bar in town and when my friends and I opened that, we decided we would have a lot of fundraisers and different things to be able to give back. The fundraisers at the bar were really important to me, and they helped make me who I am, and they helped me better understand the community I live in, although they kind of came about just because we’re dumb and young and trying to figure out how to better fit into the community, or understand the community. At the end of the day, they were great. And if there is a way for any other small business owners out there to just somehow or another fit a cause or a non-profit, or a volunteering opportunity into their every day. ‘Cause you know how it is, if it doesn’t get on the calendar, it’ll go three, six, nine months before you circle back to something. 05:45 RJ: I just can’t describe. It’s one thing to to pay the bills, to make a profit, to show up to work, and be happy. It’s another thing when you’re giving back to your community and that feeling is just indescribable. It often gets pushed to the side when you’re so busy as a small business owner. And so making it a priority. It took me a little while to figure that out, but I just… I can’t emphasize that enough. The whole reason why I moved to Flagstaff was to try and find a community, a tight-knit community, some place that was… That you could ride your bike or walk to work, that you kind of sweep off the front steps of your business and say hello everybody walking by. And then once I opened a business in Flagstaff, I felt it was my responsibility to contribute as quickly as possible to that community. 06:31 ST: And what drew you to wanting to have that kind of community? 06:35 RJ: I think the lack thereof. I grew up in suburban Orlando, outside of Orlando, but it was mostly giant neighborhoods and big highways and sprawl. And there wasn’t really a connection growing up to my community as far as a sense of pride or where you can lean on others and people would chip in, I don’t know, I just didn’t feel connected, but I came out here, I just immediately felt like I could feel the community around me. 07:03 ST: What did bring you out here? 07:04 RJ: Originally, I dropped out of college and I moved out to the North Rim in the Grand Canyon. So I worked up there for two seasons waiting tables. That brought me in to Flagstaff because there’s not a lot up there, so every once in a while you got to escape. So I used to come down to Flagstaff and I loved it. I loved it to death, and then I moved back home, I bought a house, I got a real job back in Florida and it took about four years before I was just frustrated, I was sitting in traffic one day and I was like, “I need to live in a small town.” So I still had friends in Flagstaff that had come from the North Rim and figured I’d come out here for a year or two and it’s been 13 so, [chuckle] so far so good. 07:39 ST: As you build Mountain Mojo, how much of it is creating somewhere, where you are grounded in the community? I mean ’cause you’re doing marketing when you could all be just doing it from your bedrooms. [chuckle] You don’t necessarily have to have an office. 07:58 RJ: That’s the truth. Yeah. Yeah, it’s really important. I think that one of the biggest reasons why we started the company was because we loved Flagstaff, so much. As we hired people we wanted to be able to have an ecosystem at work. That was a really nice gentle work-life balance. When we hire, we hire very specific types of people that find value in where they live, just as much as they find value in what they do for work. Flagstaff is a huge asset for us to be able to either draw people from big cities here like great talent or just keeping great talent here ’cause they could make a little bit more money down in Phoenix. And hopefully we’ll get to a point where we can be competitive, and probably pay a little bit better than Phoenix. But for right now, I think that Flagstaff is a huge asset for us. It’s a big reason why people stay. We have one employee hiking the Himalayas right now, we have another one down to Havasupai. People are biking to work. We’re really outdoor people. We have snow days, powder days where [chuckle] that’s only me in the office like Flagstaff’s important. 08:57 ST: Do you not ski? 09:00 RJ: I don’t. I skied a few times. I’m not a big fan of cold weather. So going up the mountain when it’s as cold and windy as possible is not… I’m more of an ocean person, when it comes to relaxing days. 09:17 RJ: Yeah, I spent about a month a year in Hawaii, for Thanksgiving to see my family and then a few weeks around Christmas time, New Year’s to see my dad back in Florida. So I get enough warm weather and ocean a few times a year to, I don’t know, make me happy enough. 09:35 ST: Do you feel like marketing is help… Do you think of yourself as helping people? 09:43 RJ: Yes. And at the end of the day, part of why I started the business was so many people were already coming to me for advice, specifically in marketing and I could help some of them but I couldn’t help others, and with a huge team, I knew I could help more. But I do. We lead every sales conversation with if we’re not the right fit, for you, or if we’re not producing for you, we’ll be the very first people to tell you that you need to stop using us and we’ll make all the recommendations in the world of people we feel like you should be using. I don’t ever wanna do something for someone specifically small business owners that is not effective for them. Like, really effective. So yeah, with that approach I do feel like we help who we’re working with. 10:27 ST: And why does helping small business matter to you? 10:31 RJ: Because of my previous business ownership and how I know the struggles that you face when you start getting insufficient funds, notifications and you are trying to work extra shifts to make payroll, the amount of stress that comes with that, is just overwhelming. I don’t… There’s no real way to prepare for that. I didn’t have the easiest upbringing, but at the same time I didn’t have really bad challenges, but there was no way that I could have possibly prepared for when it is you start to sign the front of checks and you have that role that responsibility for others, and their families, and that stress is so overwhelming and I see it in other small business owners’ eyes and man, being able to get them more business because increased revenue almost always fixes a lot of things is very fulfilling. It’s an amazing feeling. 11:27 ST: Have you ever had that moment, where you felt like you were looking in the mirror at someone that was you several years ago? 11:34 RJ: All the time. ‘Cause a lot of people come to us, they’re in the middle of a business plan, they want a marketing plan, they need to figure out their strategy and/or they just have a really great idea. Everybody has a great idea, but the amount of dedication and hard work and a little bit of luck and sometimes financing that it takes to be able to get your great idea to come to fruition is tough. And so nowadays I spend most of my time warning people or telling them not to do things a lot more than I do, encouraging them or supporting them or giving them marketing support. 12:12 ST: I hope you’re enjoying my interview with Rand. To support, Do Good, Be Good, please consider buying a shirt or sweatshirt. You can find out more about those on our Facebook page, facebook.com/dogoodbegoodshow. Or you can go to our website dogoodbegoodshow.com. In addition to getting a t-shirt or sweatshirt you can also really help the show by just telling other people about it, or rating or reviewing the show in your podcast app of choice. Whether you listen in iTunes or with Google Music or Stitcher, please take a moment to rate this show. And definitely if you know someone who you think might enjoy this show, please, don’t keep it to yourself. Share it with them. Now, back to my conversation. 13:02 RJ: And then the other part of it is just I’m hard-headed. Most of us entrepreneurs are… We see the way we want things to be. We see how there’s a corporate culture that works really well, it’s very efficient, it’s profit-driven. And I don’t like that at all, and it bothers me and so my hard-headedness is like, “Well we’re gonna have a really nice relaxed environment, where really high expectations, self-sufficient intelligent, creative, people driven. But at the same time, it’s gonna be laid back.” Every Monday morning we have a scrum where we all sit around and we just talk about the weekend so that people know one another outside of work more intimately. 13:40 RJ: Every Thursday we have family lunch, so two people every week, have to go and cook lunch for the rest of us, and then we all sit down and we talk about things. Once a month we have what we call beers and cheers. So we all sit around and we talk about all the individual projects that we’ve been working on because sometimes we’ll get siloed in a project and only one or two people will work on it and it’ll go out the door and then the rest of the team doesn’t really get to see the final product and the people who created don’t necessarily get to brag about it. Yeah, we meet once a month and we have some beers and everybody goes through what their work is, and everybody cheers to whatever the creative project they did, and then we hang out or we go hiking. We have a soccer team, just to make sure that outside of work, we all understand and know what our passions are so that we can better communicate at work, when it comes to high tension or high-stress situations. 14:42 RJ: Deadlines. So deadlines are always tough. But for the most part, we have an open door policy. Austin and I do where if you’re having a little bit of trouble with somebody you can immediately come and talk to us, and then we’ll all sit down. But I think that, more importantly and I try and stress this a lot with new business owners, is the hiring process and how careful you need to be. Number one, you need to be aggressive, so that you have the largest pool possible to be able to interview. But when you interview, you need to interview them as people and not necessarily as employees. Obviously you’re gonna be able to understand all of their previous work experience and knowledge and what they’re bringing to the table, but more importantly, you want to see everything that is them as a human ethically, morally the decisions they’re gonna make, how they communicate, their expectations in life for themselves, the people around them and then the people that they’re gonna share work days with. 15:38 RJ: And so, I think it starts really in making sure that who you’re hiring aligns with everything ethically and morally inside of you before you can go and start thinking about ways to better manage people, or conflict resolution, those types of things. When I see the other team members, especially new ones, communicating with one another, they’re gonna go hang out after work or they’re gonna help out one another like after work or one of them’s volunteering somewhere and they’re like, “Hey anybody else wanna go”, and then they all chime in. We have an internal Facebook group that we all communicate like new trends as a new tech and… But then we also communicate personal things in there and to see them dog-sitting for one another, or just those little tiny things, those are the little things where I’m like… They didn’t know each other a month ago, and they’re just workmates and yet they’re connecting us people like as humans, as basic as possible, so those types of moments, those always stick out. Those give me goose bumps. Yeah, once you start to connect human-to-human work just seems easy. 16:46 ST: Yeah, that’s an interesting concept. I was talking to this guy, not just this guy, he was some organizational leader who had been a leader for a long time, he was talking about the importance of having employees feel like they can bring their whole selves to work. 17:01 ST: Which I thought it was maybe a noble interesting goal. But when I think about people bringing their whole self to work, or even just what you were just saying about being real humans in the workplace, that also to me means as a human, I have my messy, bad parts about being a human too. 17:25 ST: My anger, the things that make me not as desirable to be around sometimes. I’m curious how that shows up when you’ve given people the connection and the comfort level and the ability to be more authentically themselves at work. Does that also include allowing them to be, their more messy or less desirable human selves? 17:50 RJ: I guess there are some boundaries. It’s not like we have a completely open and honest workplace where people show up in pajamas and yeah, I guess it’s just a certain amount of respect. So that sets a level of expectations that prevents you bringing everything to work. [chuckle] So, yeah, it is an interesting concept. We want them to be as open and honest. We wanna make decisions as a family, as a whole, we wanna be able to rely on one another and yet at the same time, if there are shortcomings… We made a deal with a local counseling firm, where they can go and talk to somebody else outside of work, to be able to, I don’t know, work on some of what we all have those messy qualities. So yeah, I guess that there are some small boundaries. I don’t know if it’s the whole self that comes to work every day for all of them, but as close to that as possible. 19:22 RJ: Yeah, we had a team meeting about a few months back, and we did just that. Sometimes they will get frustrated. A client will push them a little bit too far and they’ll just take a break or they’ll take the afternoon and they’ll go for a hike, they’ll go for a bike ride. And we support that and we do a lot of 4/10s where they’ll work 4/10s and then they’ll know they have a three-day week where they can go and do what they need. Austin went for a three-week raft trip ’cause he’s a big Whitewater guy. So yeah. We want them to be able to be familiar enough with themselves and comfortable enough with us where they can say, “Yeah, I’m having a bad day”, or “Give me a couple of days.” The way we hire where it’s not so siloed, or it’s not like, “Okay well, all you do is this one thing.” Since we have all of these people that can do four or five different parts of marketing we can kinda fill in the gaps when people are not around or they need some space, but yes, they all know that they clock in and out whenever they want and they can do make that decision themselves. 20:23 ST: For myself, I’ve been wanting to write a strategic impact plan, to just figure out all those different ways in my business, whether it’s just the ethics that I work by whether it’s things that I do directly for community non-profits that I wanna support, whether it’s hiring practices, every different aspect, buying practices who I buy my vendor services from. Just looking at a more holistic approach to having an impact in the community. 20:53 RJ: That sounds phenomenal. 20:56 ST: I wanna do a workshop about it at some point. 21:00 ST: I’ll invite you. 21:00 RJ: That’s a great idea. 21:01 RJ: That’s a phenomenal idea. Oh I love that. Yeah, I wish there was more time in the day to share how important it is to buy locally. Everything you gotta do locally. 21:12 ST: Right now I’m at… Over 50% of my purchasing as a business is local, locally owned businesses. 21:22 ST: So that’s one of my commitments as a business owner. 21:25 RJ: It’s interesting that you wanna build a plan and that you quantify that, ’cause as you know, once you quantify and you have a case study, once you have a case study then you can start going around telling people, “Hey, this works.” That’s such a good idea. 21:42 ST: Yeah, I was at one of the local first mixers and Kimber was talking about how important it is by local and I’m thinking, “Well, I do buy local.” [chuckle] But then I thought, “Well, I don’t know how much I buy local, and so I don’t know… I don’t have any way of measuring whether I’m buying local, more than I used to or anything. Or where I’m not buying local, that maybe I could be moving over something.” So yeah, then I went home that very night and went through my cookbooks, and analyzed and it was like, “Oh in these sectors, I am completely buying local, like here’s the areas where I’m still not buying local. Are there opportunities to move?” Blah, blah, blah. 22:21 RJ: Yeah, that’s another rule we have. Don’t bring Starbucks into the office, don’t bring chain food into the office, corporate chain. And I think they get tired of hearing me say it, but it’s all day, every day. If I have a little bit of influence I’ll take it. 22:38 ST: Yeah, and it’s interesting because there is so much focus in the ether, about [chuckle] how you always are trying to cut costs, and everything is about the bottom line, as a business owner. And I think I have, I’m grateful that I don’t have shareholders ’cause I have a little more flexibility to make things not just about the bottom line. And so sometimes, my purchasing decisions might not make sense to other people ’cause it’s like yeah, I am paying slightly more to get my printing done locally instead of just sending it to something on the internet and it’s shipped from somewhere far away. But I reached out to a local printer and said, “Okay, I’ve been ordering this online. I’m sorry. [chuckle] I was in a rush, and I ordered online, but now I have a little more time for the re-print and I’m wondering if you can print it for me and what it will cost.” And yeah, it was gonna cost me a slight amount more. But then when she asked for my address and she was like, “Oh my gosh. I grew up in the house across the street from you. My mother still lives across the street from you.” So now she hand delivers all of my printing, when she’s going to visit her mother. 23:50 RJ: That’s awesome. And that’s what Flagstaff’s about. 23:52 ST: Yeah. And then it just feels like, “Oh, oh, good. I’m connecting a mother and daughter.” I know now, if my neighbor’s in trouble, who to call. It all just feels great. 24:01 RJ: It’s a stronger community. 24:02 ST: Yeah. The show is called Do Good, Be Good. What does it mean to you to be good? 24:09 RJ: I think about this a lot, trying to be better. I do a lot of self-reflection. I don’t know, the first thing that comes to mind is being as honest as possible with everybody around you. Obviously not to the point where you’re gonna offend or hurt people’s feelings, but as honest as possible in a compassionate way, in an empathic way. And I know that if I’m extremely honest, but in a very compassionate, caring, open-minded way with others, that I’m being the best person I can be. 24:47 ST: Thanks again to Rand Jenkins for coming on this episode one. As I mentioned, this is the last episode of season three, Meaningful Work. Between now and the end of the year, I’ll be featuring some special bonus episode and follow up with guests that we’ve heard in earlier seasons. And then I plan to launch season four, in the new year. I’m still taking input and feedback on what season four should look like. So if you have an idea, I welcome it. You can send that to me at connect@sharonspeaks.com. Thank you for listening to Do Good, Be Good. For show notes on all of our episodes visit dogoodbegoodshow.com. And if you want more conversation and behind the scenes, insights come over to our Facebook page at facebook.com/dogoodbegoodshow. To subscribe to this podcast so that you get each episode as soon as it is released, search for, Do Good, Be Good, in Apple Podcast, Stitcher, Google Music or any place that you find podcasts. In fact, if you don’t find the show, please let me know. Email me at connect@sharonspeaks.com. This podcast was produced with help from Sun Sounds of Arizona. Music in this episode is Bathed in Fine Dust by Andy G Cohen released under Creative Commons international attribution license and discovered in the free music archive. This is Sharon Tewksbury-Bloom signing off.